Buffalo Bayou from a high bank in Memorial Park, looking downstream with River Oaks Country Club property on right. Flow was about 500 cubic feet per second on the morning of July 10, 2017. Photo by Jim Olive. We waited several days for just the right opportunity, checking the water flow at dawn. 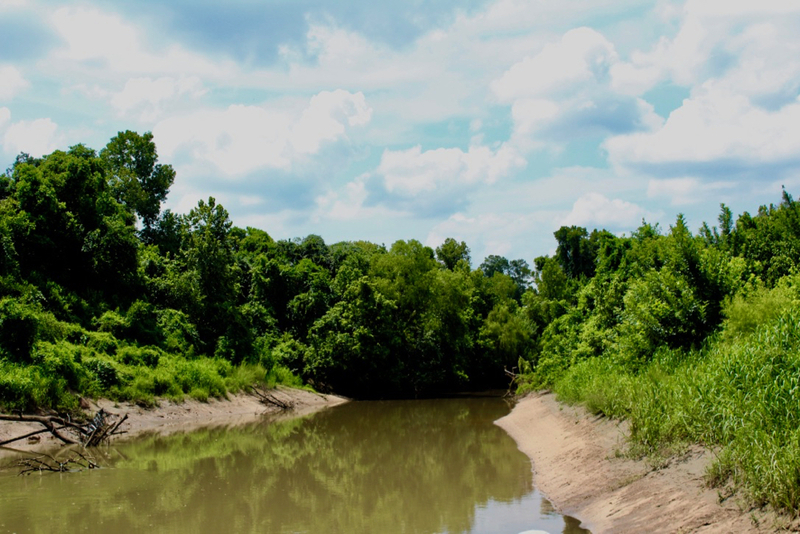 Even though there were loud, thunderous storms with angry winds and throwdown rain with cars alarmed in the afternoon, the gauge measuring the current at Piney Point, used by paddlers as well as the Corps of Engineers to track the volume of flow in Buffalo Bayou, barely popped up. And by early morning the bayou was down again to base flow, a very slow and shallow 150 cubic feet per second. For our summer 2017 photograph of the Bend in the River, we wanted a little more water in the stream. We have been documenting this same spot through the changing seasons since the summer of 2014. But late Monday Jim Olive called and said a rainstorm was predicted during the night. And sure enough after nightfall the oak trees began wrestling with the wind. Lightning exploded overhead and a drenching rain shot out of the sky. At 5:45 a.m. the Piney Point gauge indicated a flow of some 500 cubic feet per second. We met in Memorial Park, at the parking lot for the South Picnic Loop. Jim looked at the sky skeptically. Gray clouds had drifted in. But we were there, so we walked towards the woods across the boggy picnic area, stepping around puddles, dodging the early morning cyclists whizzing around the loop road. The Memorial Park Conservancy still hasn’t done anything about diverting the rainwater runoff from the park and parking lot that’s eating away at the ravines in the woods. But someone has pruned and slightly opened up the narrow dirt trail leading around the ravaged ravines, now decorated with summer greenery, and past the clay and concrete remnants of the drainage pipes from Camp Logan, the World War I military training camp and hospital located in the park before it was a park. Our shady spot on the high bank overlooking the bend of the river has changed over the years. 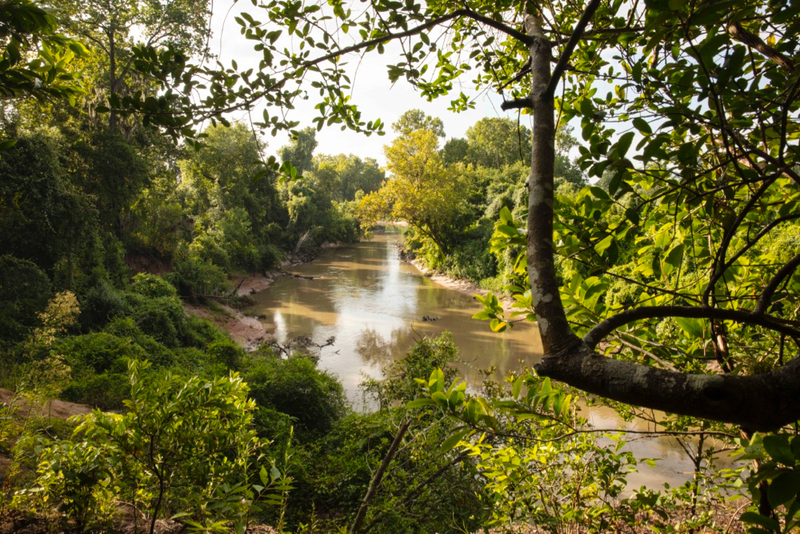 During the great rains of 2015-2016, high waters caused sections of the bank to slide down, taking trees and vegetation with it. But the living trees and plants and even some of the soil remain at the foot of the bank, collecting more sediment, and the vegetation continues to grow. The bank here and elsewhere was healing nicely. Jim set up his tripod and waited for the sun to arrive. The sunlight had to be just perfect. This takes time and patience. So the photographer’s assistant had plenty of opportunity to roam through the woods looking for mushrooms. No luck. Too hot maybe. But a frog hopped on the trail, maybe a departing member of the hidden chorus of Mr. Froggies singing love songs late into the morning. A pair of nervous turtles swam in the clear, shallow stream that drains the center of the park and empties into the bayou nearby. 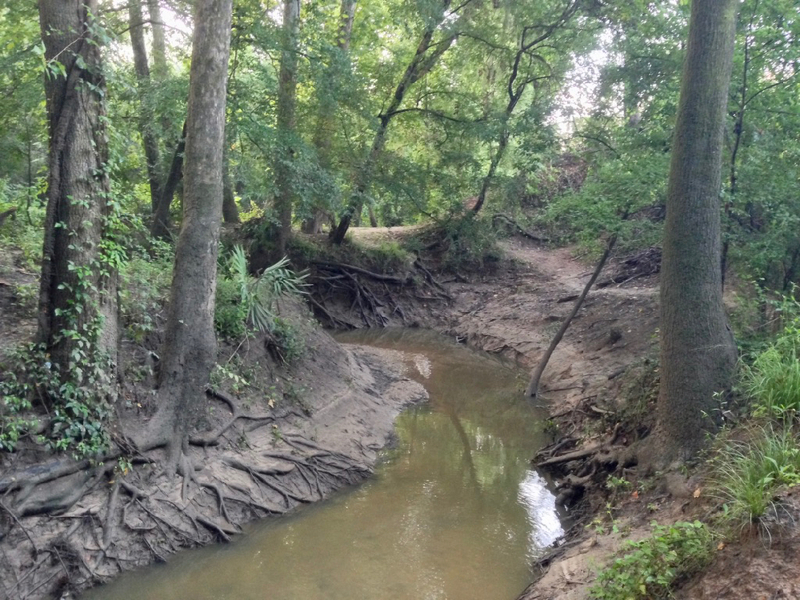 The Harris County Flood Control District plans to dam this lovely stream for some reason as part of its $12 million restoration/erosion control/conveyance project. A great blue heron flew slowly back and forth across the bayou, trying to get into the picture. Eventually the sun did arrive and struck the leaves and water just right. Jim got his beautiful photo. To view the entire series, visit A Bend in the River under Photos and Films. 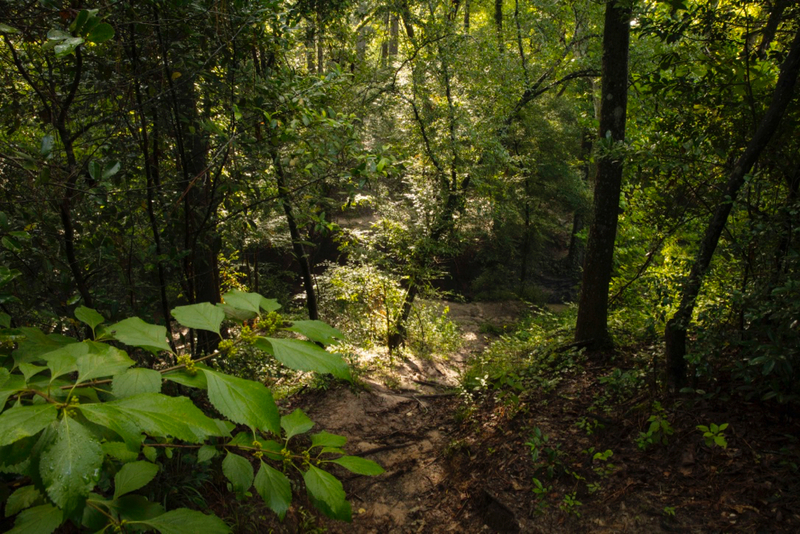 Sun streaming through the woods on path leading to small tributary of Buffalo Bayou in Memorial Park. Photo by Jim Olive on July 10, 2017. Trees standing guard over the small tributary flowing through Memorial Park, under Memorial Drive, and into Buffalo Bayou. Photo by SC on July 10, 2017.